Every shade of blue is represented in these chunky yarn scuffs, great for easygoing days, indoors or out. The Blue Rainbow scuff has simple stripes with aqua pops of color mixed in; the Blanket Knit scuff is inspired by traditional hand-woven Southwestern patterns. 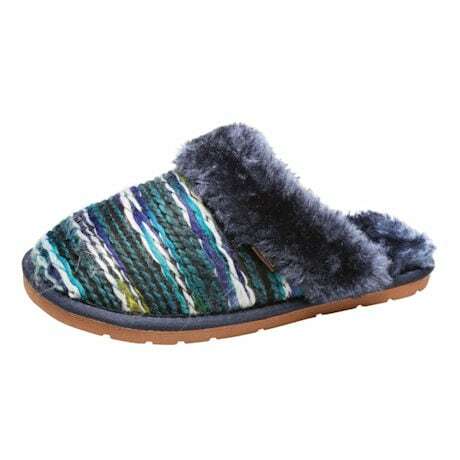 Washable 100% acrylic knit with polyester faux fur lining. Imported. S(5-6), M(6½-7), L(7½-9), XL(9½-10), XXL(10½-11).